The principles were clear and simple: Everyone has the right to quality health care, and people want and need a site where all their health needs can be addressed in one location. The solution, more than a decade in the making, is Care Point Health and Wellness Center. Located just south of downtown Tallahassee on South Monroe Street, the center is celebrating its one-year anniversary this month. Care Point is a not-for-profit organization that provides quality health care to everyone from employees at local businesses, to area seniors, to families and individuals. In its first year of operation, it served 900 patients, with thousands of medical appointments. Significantly, while Care Point accepts all major insurances plans from Florida Blue and Cigna to WellCare, Medicare and Medicaid, health care is also available to those without insurance. Care Point partners with other local agencies to provide services on site, such as mental health services available through The Apalachee Center and prescriptions through MailMeds Clinical Pharmacy. MailMeds can provide medications at the pharmacy, or through the mail at no extra charge. 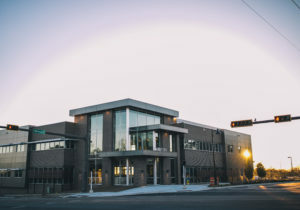 In addition, Bond on Magnolia, inside Care Point provides another option for medical care, and the center’s dental care services began operation in November 2018. The building design – by local architect Bonnie Davenport of BKJ, Inc. Architecture – was selected as one of the Top 10 People’s choice Award Winners for 2018 by the American Institute of Architects Florida. “In my LT class I often refer to them as the class that built Care Point, as I had so many classmates helping bring this facility to life, from volunteering time to competing and winning contracts associated with the center. It’s a real testament to both the talent and the creativity that lives here in Tallahassee,” said Renzi. Care Point has also positively impacted the local economy, creating 19 new jobs and helping further revitalize the South Monroe district. If you’re interested in taking a tour of the facility, becoming a patient, or even using the facility’s conference room, visit the website at carepointwellness.com or call Patty Ballantine at (850) 354-8765.